Web based GIS services has added altogether a new dimension in which GIS industry works. Web GIS has made it very easier to share spatial data over World Wide Web and it can be accessed by any user in any corner of the world without having any special GIS software loaded on his machine. 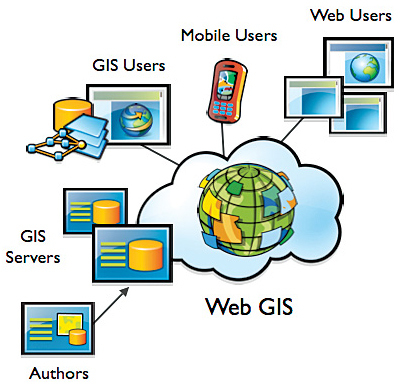 Web GIS have the potential to revolutionize the way in which GIS is developed, accessed and used all over the world. Web GIS generally uses 3-tier architecture. It has made it possible to access the attribute data along with spatial data over internet. Basic queries like- Routing, Wireless Location, Address finder can be performed easily. This data can be integrated with other upcoming technologies e.g. GIS integration with Mobile Phone, GIS integration with CCTV. It possible for user to access GIS data and functionality through the web and to integrate them with their own systems and applications without the need to develop or host specific GIS tools and data sets by themselves. Web GIS has helped to create platform independent distribution channel for GIS data. Applications can share data from different data sources and formats and have them combined in a single application, without it being apparent that data has come from different sources or locations. Desktop GIS is having certain limitations. User need to have specific software installed over his machine; Data can not be shared outside your organization or also within organization; it is difficult to download data from various sources and view it over some common platform. These difficulties have been overtaken by Web GIS. Data can be shared all over world without having any specific software. Government organizations like Land Records or Municipal Councils can publish their data for the usage of common man. Web GIS is playing a key role in making GIS technology reachable and useful to the thousands of it users in a true sense.